Home / Health / A privilege health card for Senior Citizens! 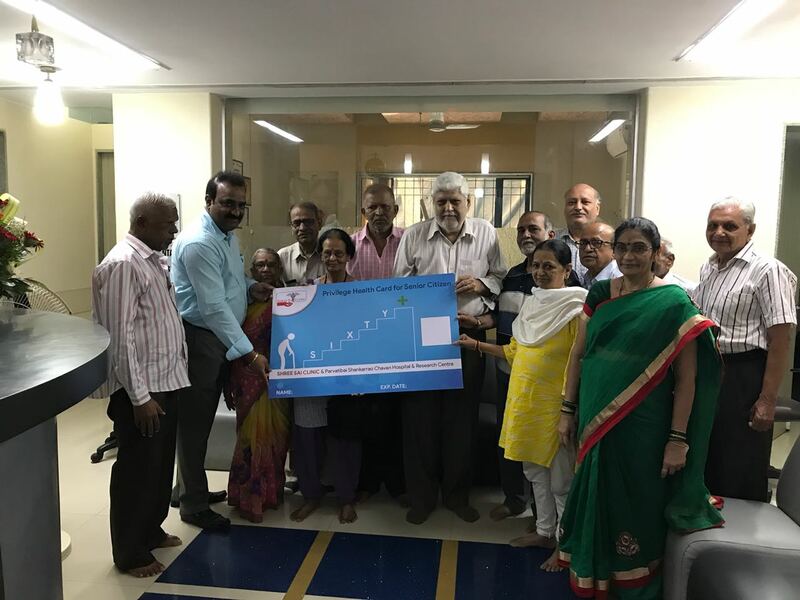 Shree Sai Clinic, a Multispeciality Hospital launches health card for elderly to get benefits on its 12th anniversary of upgrading the facility. 16th April, 2018, Mumbai: On the occasion of the 12th anniversary of Shree Sai Clinic, a multispeciality hospital, Goregaon has unveiled a privilege health card for senior citizens to get benefits on diagnosis, pathology and surgical treatment. More than 200 senior citizens have been screened freely for 12 parameters includes HB, CBC, ESR, bl group, Blood Sugar fasting, Se, Cholesterol, Sgot, SGPT, Se Creatinine, Urine routine, ECG consultation. It also included 10 minute talk on dental care and joint pain by specialist. Elderly shall be entitled to various benefits on health check ups for life time. Dr. Sunil Chavan, Managing Director & Orthopedic Surgeon, Shree Sai Clinic says, “Aging can bring about various health issues, it’s important to understand the challenges faced by people as they are growing older and older. Senior citizens usually suffer from various Orthopedic ailments such as arthritis, joint pains, weak bones. Also, Heart disease, stroke, cancer, diabetes, Bp, Obesity, Alzheimer is among the most common health ailments which they face. Hence we thought of introducing a health card and enrolled member will get benefits on it. Shree Sai Clinic has eminent doctors from various fields in their panel. Their expertise coupled with the efficiency of the nursing staff ensures that the patient receives the best of medical care. The specially trained administrative team ensures smooth running of the hospital and comfort of the patients and their families. The Doctors in the panel include specialists and super - specialists from the faculties.